You like to watch? Go to Good Fella, where there's not a bad seat in the house – whether you're at the bar, eyeing off the baristas at the central work station, or up at the narrow mezzanine section taking punts on how many people already at the cafe will know the next customer to arrive (everyone? Odds on). Could be the clientele are all workmates, classmates, or just part of the loyal band of followers who swoop at anything that the peeps behind other local faves The Baron and Tuckshop turn their hands to. 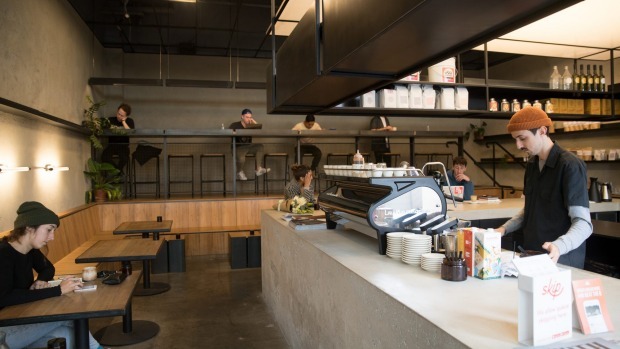 While Bella Vista Business Park mightn't be the most lovable locale – so busy, so business-y, so much construction (the future Norwest train station is taking shape across the road) – Good Fella is a good reason to visit: a high-caffeine, high-carb, escape from the hub. It ticks all the boxes in the industrial cafe stylebook: polished concrete, minimal colour, exposed air ducts, simple timber tables and seating. But with all seats facing the cafe's centre (and the big coffee workstation at its heart), it has a cosy, sociable feel. The set-up has been put to good use as a makeshift classroom, with Good Fella hosting lessons in home brewing techniques. And it's an occasional office, too, with more than a few punters tapping away at laptops between sips from sturdy Atelo ceramic cups of coffee. Bagels are the go-to. They're made in house – properly boiled and baked – served plain, with a simple spread, or topped with avocado, a chilli salt kick and fresh lime wedge. 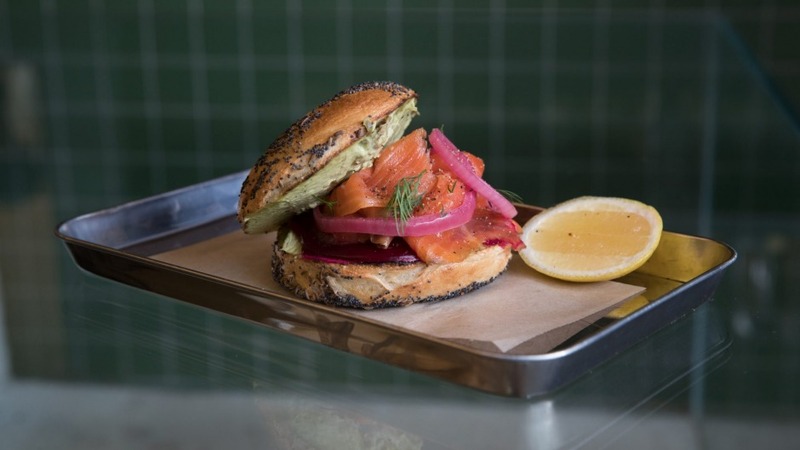 Or fill up on the salmon option, with cream cheese, pickled beet, red onion and smoked salmon. Blueberry bagels were sold-out on our visits but reports are good. 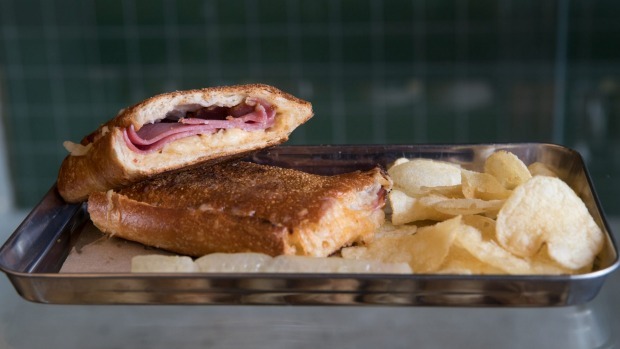 Bagels aside, the Reuben toastie rates high, with pastrami, sauerkraut, gruyere cheese and Russian dressing – and on the side, potato crisps and long zucchini pickle. There's also pizza by the slice with simple, sparse toppings, sandwiches, toasties, a seasonal salad, and a few house-baked sweets. And keep your eyes peeled for pop-up nights – as we went to press, Toby Wilson of Ghostboy Cantina was gearing up for a snacks and tacos night at Good Fella. It was billed as a one-off, but you never know your luck. Single O provides beans – the Killerbee blend used for milk coffee and cold brew – and guest roasters feature every month or so. On our latest visit, Melbourne's Wood and Co Coffee Roasters was on show, their Ethiopian Sesaga making a vibrant espresso. The baristas are happy to give you the lowdown on what they're using for what – be it white, black, cold brew, batch or pour-over. If you're lucky they'll use the sleek-looking Mavam espresso machine, the bulk of which is hidden beneath the counter, so nothing obstructs the view of your coffee being made. No licence to serve booze here, but the intention is to apply for the right, along with permission to open on Sundays. So keep watching. Loving The cafe layout and everyone-knows-everyone vibe. Not getting Don't mind order-at-counter, but a printed menu to mull over would be helpful. Overheard "Dude, you killing time between assignments, too?"